When I was small I hated spinach and I couldn’t eat mushrooms. These are now two of my favourite vegetables, but I love any vegetable, with the exception of fennel. The aniseed flavour puts me off, maybe as a result of those crazy Pernod parties we had at college but even a whiff of pastis at a bar will turn my stomach. I love gathering veggies from my small potager to use in the kitchen. The peas have come and gone, all my good intentions about making a summer soup, a pea risotto, even freezing some for the winter, never came to fruition because as soon as they were picked we ate them greedily. And they were so sweet and delicious. I pick the chard regularly, and because Roger’s not a great fan of greens (sigh!) I tend to chop it into curries or a minestrone soup rather than serve it alone which I look forward to with pleasure when he’s not around – steamed with some butter and nutmeg or a twist of ground pepper. Fresh beans have become a staple accompaniment. They are always best eaten fresh but I freeze plenty, blanching them for a minute so they keep their colour. The courgettes are generous and demand regular attention. It’s lucky they are one of the most adapatable vegetables and are as happy in a ratatouille as they are baked in foil with goat’s cheese, or grated and added to a cake mix. I’ve only got two plants this year. One green, one yellow. That’s plenty for us without becoming a slave to processing them or having courgettes at every meal. 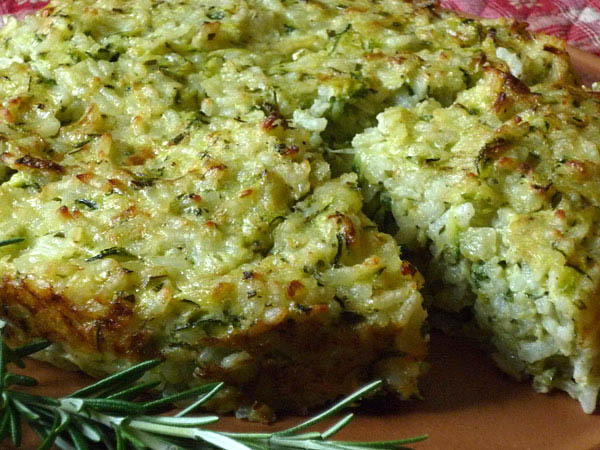 One of the best ways I’ve found to use a few courgettes of either colour is in this savoury rice cake (see recipe below) which I discovered in the 2008 edition of the BBC Good Food Vegetarian summer magazine and have used frequently ever since. Our favourite way of serving the cake is with a fresh tuna steak and a hot tomato or a red pepper sauce, or as an accompaniment to Provençale chicken. As it contains egg and cheese, vegetarians will find it a satisfying meal served with ratatouille. Heat the oven to 180C and line a 20cm springform tin with greaseproof paper. Bring a saucepan of water to the boil and cook the risotto rice for 8 minutes. Meanwhile, fry the onions and courgettes in a tablespoon of olive oil for about 5 minutes, stirring regularly. Drain the rice and put it into a large bowl with the crushed garlic, the remaining olive oil and the onion and courgette mixture. Stir well and leave to cool while you prepare the remaining ingredients. Lightly beat the eggs and add the cream. Grate the cheese. After about 10 minutes, add the egg mixture, grated cheese, nutmeg and seasoning to the bowl and mix thoroughly. Put the mixture into the prepared tin and press down with the back of a spoon. Bake for about an hour until the top is golden and the cake is firm to the touch. It might need a bit longer if the mixture was a bit wet. Allow to cool slightly, then release from the tin and serve on a plate. I usually halve the above quantities ( one egg is sufficient), providing four ample portions.